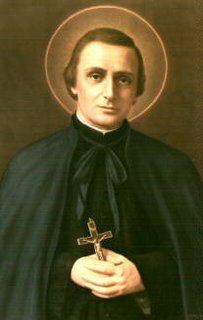 Today Holy Mother Church remembers St. Peter Chanel, known as the “Apostle of the South Seas” because of his missionary efforts on the island of Futuna. Fortunate, isn’t it, that everything doesn’t rest on our weak shoulders. We are instruments of God, yes, but all that we need to do is witness to the faith we know is true. This fits nicely with Fr. Don’s homily today. He explained that the word “martyr” means witness, and that is precisely what we are called to be. Usually not to the point of death, but certainly we must suffer social rejection in the name of our Lord. The first reading (Acts 7:51 – 8:1a) tells us about Stephen, who chastises those people who had denied the prophecies and put the prophets to death. When Stephen reminds them that those prophecies came true–that they were told the truth but wouldn’t accept and acknowledge it–they are enraged and put him to death. Yet there is Saul, who sees all that is going on, and as it is happening, he cries out in belief: “Lord Jesus, receive my spirit.” Fr. Don reminded us that Saul, later Paul, must have recalled this day regularly for the rest of his life in shame. He had witnessed a righteous man testifying to the truth be put to death, and he simply sat there and did nothing. Nope, we must be witnesses, no matter the cost. But God gives us the courage we need to do this. St. Peter Chanel must have known this well, for that is exactly what allowed him to remain so strong and faithful even in the moments right before his death. In today’s Gospel (Jn 6:30-35), we see that God always gives us the bread from heaven–Our Lord–so that we who receive him in the Eucharist might go out into the world and bring the faith to others–through our actions, our prayers, and yes, our witness. The faith lives on, not because of us, but because of Him. And it is He who strengthens us to be witnesses. St. Peter Chanel: Pray for us! Looks like St. Peter grew a nice tree. On a website I looked at it said Lutuna is 99% Catholic. Why does this saint seem to look a bit like you to me? Maybe it is an expression or something. I don't know..anybody else? Thanks, Kevin, for pulling that stat up. A solid tree indeed. I agree, Suzanne, about the resemblance. He is quite handsome!